One of our most gifted writers of fiction returns with a bold and piercing novel about a young single mother living in New York, her eccentric aunt, and the decisions they make that have unexpected implications for the world around them. Reyna knows her relationship with Boyd isn't perfect, yet as she visits him throughout his three-month stint at Rikers Island, their bond grows tighter. Kiki, now settled in the East Village after a journey that took her to Turkey and around the world, admires her niece's spirit but worries that she always picks the wrong man. Little does she know that the otherwise honorable Boyd is pulling Reyna into a cigarette smuggling scheme, across state lines, where he could risk violating probation. When Reyna ultimately decides to remove herself for the sake of her four-year-old child, her small act of resistance sets into motion a tapestry of events that affect the lives of loved ones and strangers around them. 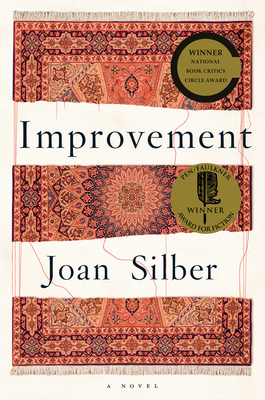 A novel that examines conviction, connection, and the possibility of generosity in the face of loss, Improvement is as intricately woven together as Kiki's beloved Turkish rugs, as colorful as the tattoos decorating Reyna's body, with narrative twists and turns as surprising and unexpected as the lives all around us. The Boston Globe says of Joan Silber: "No other writer can make a few small decisions ripple across the globe, and across time, with more subtlety and power." Improvement is Silber's most shining achievement yet. JOAN SILBER is the author of eight books of fiction and the recipient of the 2018 PEN/Malamud Award for Excellence in the Short Story. The most recent, Improvement, is the winner of the 2018 PEN/Faulkner Award for Fiction and the National Book Critics Circle Award for Fiction. and was listed as one of the year's best books by the Washington Post, the Wall Street Journal, Newsday, the Seattle Times, and Kirkus Reviews. Her previous book, Fools, was longlisted for the National Book Award and a finalist for the PEN/Faulkner Award. Other works include The Size of the World, finalist for the LA Times Fiction Prize, and Ideas of Heaven, finalist for the National Book Award and the Story Prize. She lives in New York and teaches at Sarah Lawrence College and in the Warren Wilson MFA Program.